Yes, I know, it’s been almost 1, er…2…3 months a long time since my last post and I could probably come up with a whole slew of excuses as to why I’ve failed to write. Instead, I’ll just be honest with you and myself, and just openly admit that I’ve been lazy, wretched, and self-serving. What can I say? I’m a warlock right? In my last post back in November, I started to write up my own version of a basic “How to Demonology Guide” and I really did have every intention on getting it done. Since I’m a hack writer who constantly finds myself nitpicking and rewriting what I had previously written I soon came to realize that with all of my never ending revisions that I actually had written the post two or three times over. 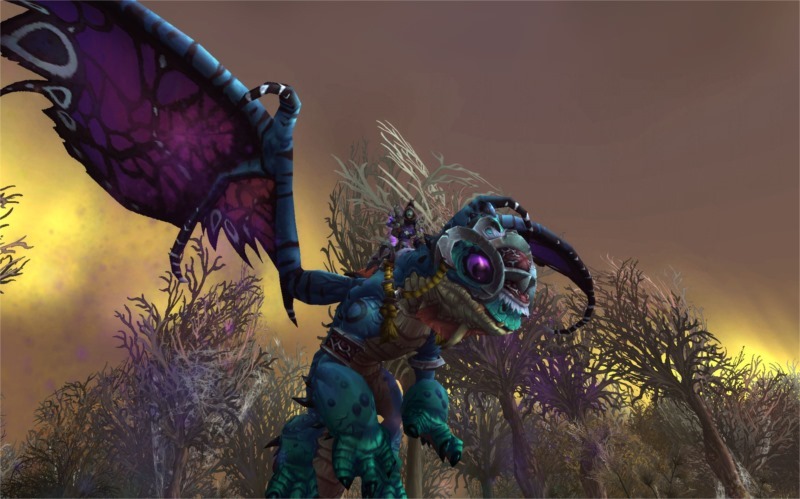 I know the expansion is winding down and it’s probably irrelevant at this point in time, but I still plan to get it posted because I’m still saddened that I haven’t seen very many Demonology warlocks anymore, and it is my hope that maybe, just maybe, a new fledgling warlock will read it and it might inspire them to try Demo. Fwiw, I really do need to explain my absence if only to shed some of my own guilt so please humor me ;) A few days after my last post a couple of things occurred which made me lazy. First, my area was hit with two different snow storms that kept us from leaving our home for almost 2 weeks. My company also changed their vacation policy and I was forced to take three weeks of vacation before the end of the year. Then the Christmas and New Year’s Holidays arrived and they were followed up by our area getting hit with two more ice storms. So in a nutshell time has flown past me in a flash. What did I do during all of that down time? Omg, lots! I’m now running on two different flex teams, and I’ve filled in for a bunch of other teams with my alts on the nights when I’m not actually signed up to raid. Oh, and I guess I should mention I went from six toons at cap to now having 12! You might be wondering how can I blame some snow, extra vacation time, and the holiday season as a reason for my being lazy when it comes to putting out posts? Well, I can blame them quite easily actually, but I have to truly blame two people who inspired me. You see, back in the early part of November I listened to @Ashayo and @Eljeppy on WoWgeekly as they discussed taking advantage of the Recruit-A-Friend program to help speed up the leveling process. I’ve always drooled at the 2 player rocket mount that you can only get through RAF, and when Blizzard offered up such a good deal on purchasing the game less than a week later it only helped to force and embolden galvanize my thoughts on getting a second account. Between hearing @Ashayo and @Eljeppy, and seeing Blizzard offering such a cheap deal I was already teetering on the edge, but it really was during that first snow storm hit that I jumped into getting a second account and taking advantage of Recruit-A-Friend. You see, normally when my area gets hit with that much snow and ice we either lose our cable and internet, or our electric service, and sometimes we lose both. This time; however, we were trapped inside our home but were fortunate enough to never lose any of our basic services. We had heat, we had TV, we had internet, and we had plenty of free time since we weren’t able to go anywhere. On the very first day of being snowed in our home my oldest asked if she could play WoW. I let her start a new character on my account and after an hour or she approached me and asked if there was anyway we could play together. She didn’t have to ask me twice ;) and so I got her signed up on RAF. For the next five days, and for only a couple of hours each day we spent some Dad and daughter bonding time by questing, drinking hot chocolate, and running a ton of dungeons. 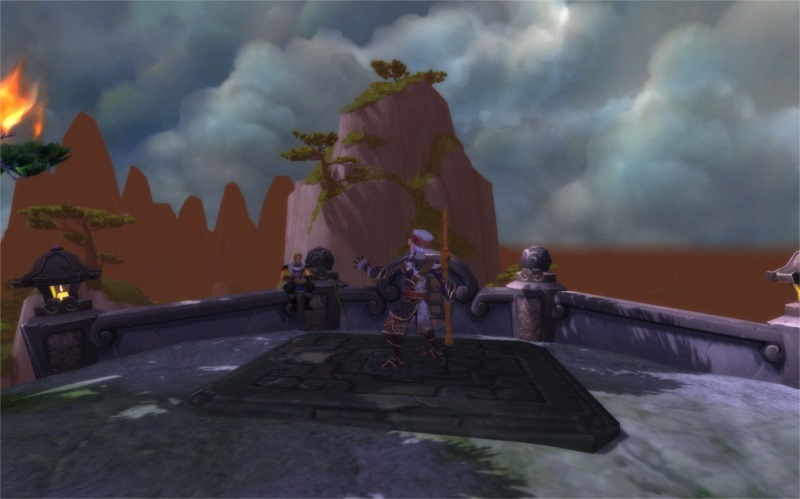 When the snow began to melt less than one week later our toons had already reached the starting quest for the MoP Expansion. While my motives in purchasing a second account with RAF at the beginning might have been greedy and self-serving because I wanted to level a few new alts faster, and because I wanted that sweet two-player rocket mount it actually turned into something quite different. Instead, I found that I got to spend a lot of time with my daughter that was different from what we do in our normal lives. Don’t get me wrong, as a family we do a lot of things IRL together because we camp, we boat, we float, we hike, and from time to time we take trips or go on vacation. 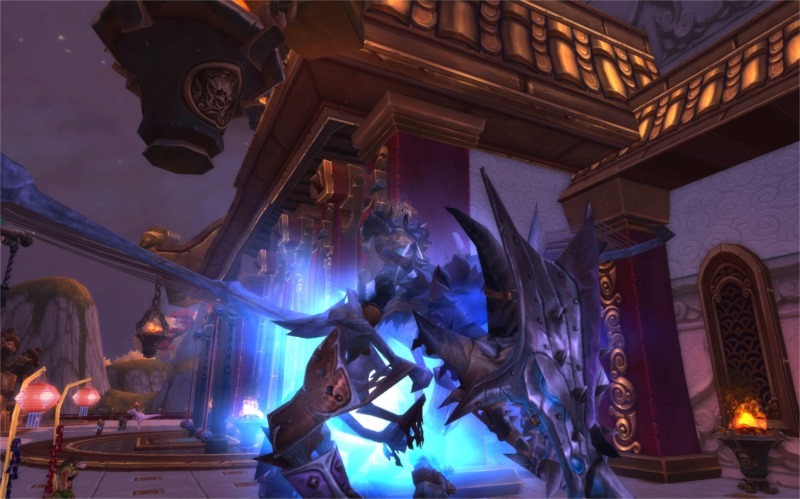 During the week we’re like most families in that we do homework, we attend sports games, and we try to stay sane with the demands of busy life; however, playing WoW with my daughter this time was something a little bit different and a little more special to me. It was different because I got to have my daughter’s time and attention all to myself during the winter storms. She leaves for college this summer and I’m going to miss her more than she’ll ever know. So yes, I was greedy and self-serving in wanting to spend time with my daughter if even for a few hours fighting bad guys and flying on dragons. My daughter is old enough that I’ve come to grips with the fact that she’s not a little girl anymore. I’ve come to grips with the fact that I’m not the center of her world anymore like I was when she was younger. I’ve come to grips with the fact that when she leaves in six month to go off to college that her childhood years have come and gone and that they’re never going to come back. So forgive my friends for being greedy and self-serving, and for being a few months behind on my posts. I’ll be finishing up my demonology guide soon and from there I plan to write a post about taking a look at warlock demons and the skins that I would like to see available for them. Hunters can have their pick and choosing of companions so why can’t we? Along with that I’ll be going back to look at more warlock transmogs, and I’ll be highlighting a few more warlocks with my Unleashing the Warlock Within series. I’ve got some things to rant about that I think need to be fixed for in-game quality of life stuff, and I want to talk about what warlocks could give up for the battle of the button bloat. Button Bloat – What can we live without? Taurens can wear anything and they still look good. The view from the level of a gnome makes my neck ache. Tanking is a lot more fun than I remember. 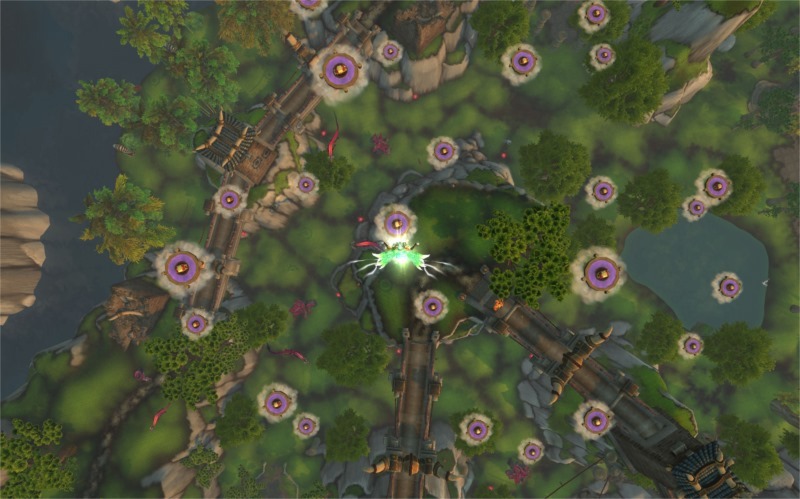 Trying to work too many farms on too many toons can become a second job and really hampers your play time. A new player has enough curiosity and questions to try your patience. Pet battling still isn’t for me. What you think is a fun aspect of the game isn’t always what someone in your party finds enjoyable. Newer players have a lot less tolerance for the trolls in LFR. Hot chocolate is best served with six medium sized marshmallows. *If you want to hear a funny story listen to the latest Training Dummies podcast (Episode 61 titled – Bowling Bumper Boss Mods) to hear how Rob (Hotpox) found out my daughter plays WoW too. To everyone who wrote and tweeted me about the “Winter Veil” song I did during the holidays, thank you! I really do appreciate the kind words. I haven’t had time to work on any segments lately, but I will be making more. The expansion is winding down and to be honest, so am I. I’m giving serious debate to taking part in the beta for The Warlords of Draenor due to time constraints and knowing how busy I’ll be getting when summer gets near. My segments are fun to put together and they do keep me out of trouble so I’m sure when inspiration hits me you can expect to hear some more snarkiness, and maybe even a very badly sung song or two. Until next time, stay warm and have fun! I think it’s great you were playing with your daughter! And tautens do not look great in everything… Helms are my biggest issue. Awesome! Don’t think of college as a stopping point for this renewed WoW relationship. I have a guildie who is deployed overseas for the military. She got her mom a WoW account and numerous times you can see her and her mom playing together. Mom had even been on a few raids when the guild was active. Use the in-game chat, mumble or skype and you both will have something to talk about and spend time together, even if the distance of school doesn’t permit. While I’d like to think we could make that happen, in reality don’t see it happening. I’m sure when she comes home to visit that may change. For now though, I’ll enjoy the time with her while I can. She’s run with one of my flex teams and now she’s getting the raiding bug too. Makes me wonder if that’s a good thing or a bad thing because I see how she is when it comes to pet battling! Made the recent switch to a 90 lock as my main, and was in search of some good reading material when I stumbled upon this. Very well written, I’m anxious to see if your demonology guide will convince me to break away from destruction :) I think it’s great that your daughter was interested in playing with you, my son is only 6 months old so I can only imagine the excitement of sharing a hobby with someone you love and care for. I wish you the best with her transition to college, and look forward to reading future posts. Thanks for stopping by! I’m not as active in my writing as I used to because as you know I’m being lazy. Grats on the baby! Enjoy it because people will tell you how the time will fly and believe me it will be a blur when you look back after they’ve grown. I plan to have the demo guide up by the end of this weekend, but never truly trust a warlock ;) and let me be the first to welcome you to the dark side in your wise choice with your new main. If I can be of service or help in any way, please let me know.